Constructed of durable Lexan®, this plotter won't melt, warp or break in extreme temperatures. 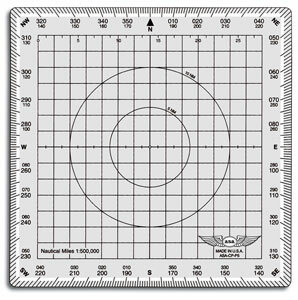 Its convenient 5-1/8" square size and ease of use make this plotter a pilot favorite for simple, accurate flight planning. Uses a 1:500,000 scale and includes 5 NM and 10 NM radius rings for quick and easy measurement. The 2 NM grid makes alignment with parallels simple. Plus, it's guaranteed for life!